"I love this recipe, especially while babysitting younger kids (they love this) and during the hot summers (when it's unbearable to turn the oven on). It's quick, easy and clean." 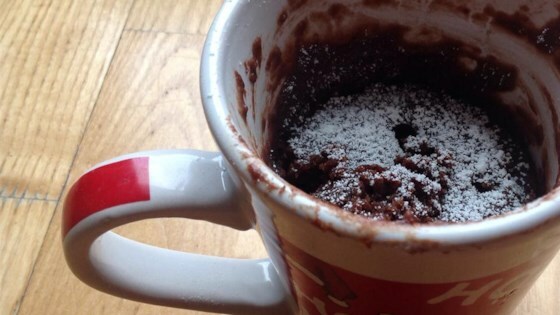 Stir flour, sugar, cocoa powder, cinnamon, and salt together in a microwave-safe mug. Stir water, oil, and vanilla extract into flour mixture with a fork until smooth. Microwave until set, 1 to 5 minutes. Do not use extra-virgin olive oil in place of vegetable/canola oil. Hot chocolate powder mix works in place of cocoa as well. 5mins is too much time...i almost burnt my cake but luckily i turned it off when i smell choco :P overall it was alright!!!! Looks good, just came out. Added a pinch of baking powder and it took 2 mins to cook. It has a cake like consistency. I used an extra large mug too. Pretty good! Easy, quick chocolate fix. Not as great as brownies out of the oven but the recipe has a place in the box.